I live in Russia and use in everyday life 3 languages: Russian, English and Japanese. If you use Japanese IME you don't need to have English input language by itself, Japanese IME has direct input mode that enables you to just type in English. I prefer to have the Windows system language in English, because it's easier to use this way. In Windows 7 you could have set the system language to English, and use only Japanese and Russian input methods. Most typing is performed in either one of the languages or in two of them, so switching between only two input languages isn't bad. Switching between 3 of them is annoying though. For example, when I type something in Russian, than switch to English to type something in English. If I then need to switch to Russian once more, I need to first switch through Japanese, so I have to do 2 switches. When I did upgrade to Windows 8 I tried to do same setup and got all my Windows 8 style apps in Japanese because Windows 8 now links input languages to Windows 8 style app display languages. I can override System display language to English in Advanced options, but it gets only half of my system to English, other (Win8-style) half remains in Japanese (or another highest priority language). This question is not a copy of that, you can't add Japanese IME or Russian keyboard layout to Enlglish display language. Use hotkeys for switching to certain layouts. This can help with all issues, but I want to leave this as a last option. Somehow make new Win+Space language switcher more MacOS-ish (asked in different question). This will enable possibility to use a lot of input languages at the same time and most switches will happen between 2 used at the moment. 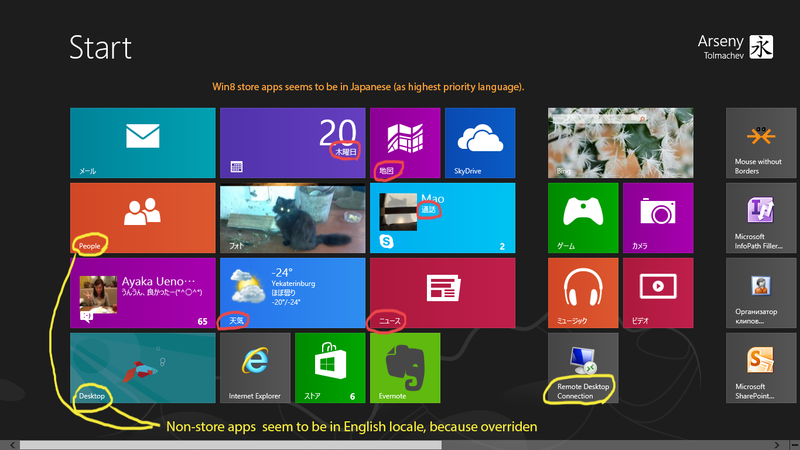 Somehow separate Win8-style apps display languages from input language sequence. I wonder if there are some registry hacks. There is very similar question in MS forums and I asked this question one more time to MS support directly. I will post answers here if they will be helpful. I use a custom international keyboard layout with alt deadkeys, but occasionally Spanish, Portuguese, or Chinese. So I'm kind-of in the same boat as you. Since you are using windows 8, this shouldn't be a problem. You seem to have a great answer to your question about MocOS-ish keyboard layout switching, you should seriously consider it as an answer because short of changing the operating system itself, that's going to be it I think. For #3 — that user is wrong about the two being the same. The display language and the input languages are separate by design. You can switch your language for input at will, with win+space to cycle through the list of languages you can configure. You can have the lanauge settings apply system wide for input, or just for the current application. And you can configure the display language to always be different from the input language. Select your language preference for input method from the second item. If I understand correctly, you want to remove the English IME. The top-most language can't be removed, so just move it down. When you install a display language, the relevant input method will also be installed. but it seems that you can't remove an input method without removing its relevant display language. It would seem that windows 8 takes an input language and its display language as a whole thing. Not the answer you're looking for? Browse other questions tagged windows-8 language input-languages or ask your own question. How to control the Windows 10 metro app (modern UI) display language?